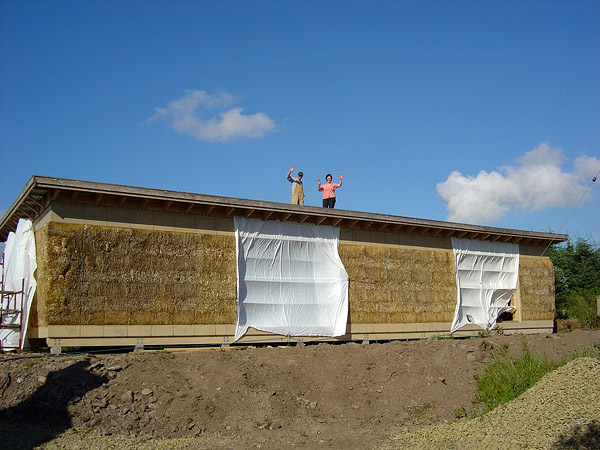 Sunnyside Croft Studio is a 5m wide x 20m long timber and straw bale structure, finished using traditional lime render and lime wash and capped with a ‘living’ roof. It is located near to Sunnyside Croft, a small traditional stone - built cottage near the Buchan coast. 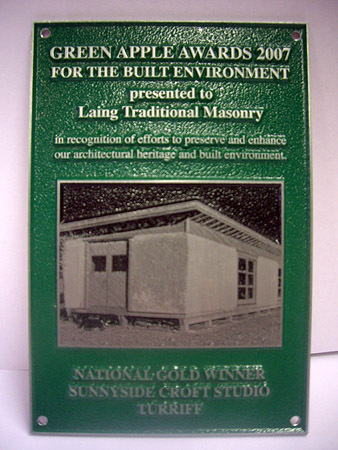 The studio is a unique example of ecological ‘new build’ construction, combining traditional skills and materials with modern construction technology. 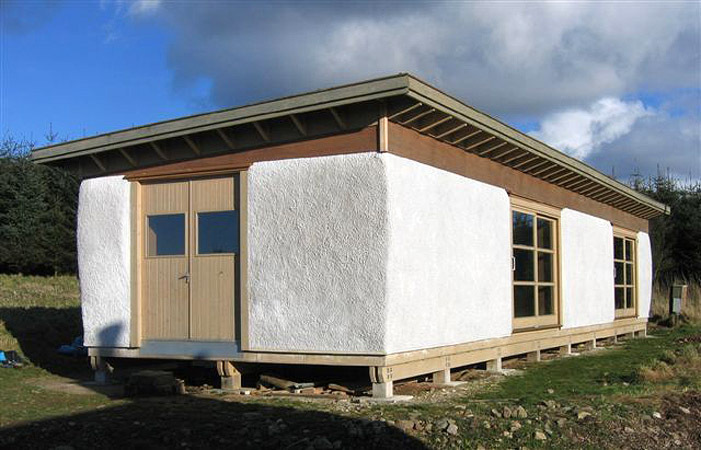 It draws on the local vernacular tradition of using natural buildings materials such as timber, lime and clay and incorporates innovative design solutions to create a distinctive and truly sustainable building that respects and blends with its environment. Pictured: Foundation: tyres and rubble. LTM have been involved in the project from inception to completion, acting as specialist consultants, training advisors and volunteer site operatives. 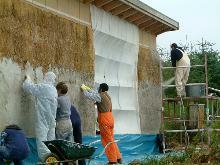 The building involved the use of both traditional materials and recycled products. 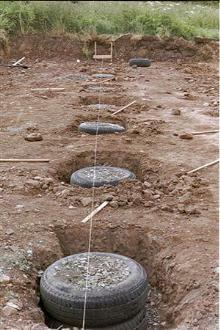 The foundations were constructed using recycled car tyres and paving slabs. 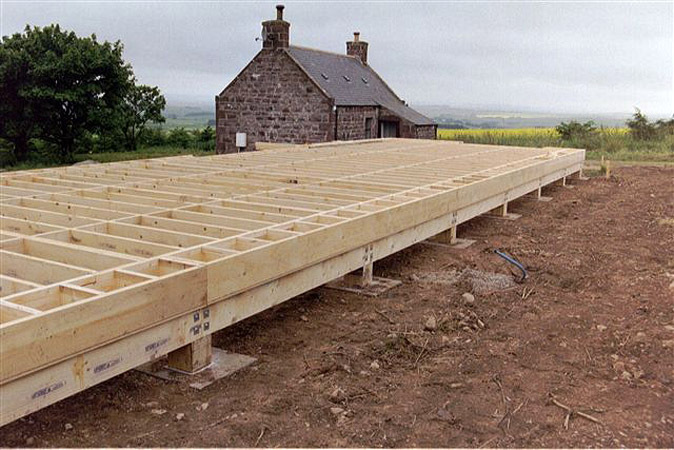 The timber floor floats on a grid of pads and the load bearing walls are made using straw bales finished externally in lime harl and internally with clay render. 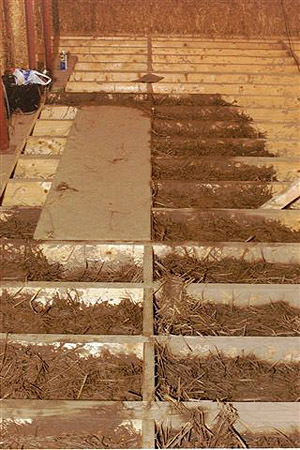 The soil roof is borne by recycled corrugated iron. Pictured: Lime render application: mechanically sprayed and manually pressed into straw substrate. The project team involved a variety of individuals and volunteers as well as specialist firms, including architects and designers, contractors and suppliers. LTM acted as a site operative and organised training workshops on a range of topics, including lime harling and plastering. The studio thus became a hands-on learning opportunity for all involved, thereby ensuring the lessons were shared far and wide. Pictured: Load bearing walls: construction in progress! The studio has been recognised as a pioneering example of its kind, representing the growing popularity of ecological design within the modern construction industry. LTM submitted the project for the prestigious Green Apple Awards in 2007 on behalf of the owner – and won!